Climathon is a global 24-hour climate change hackathon which will take place simultaneously in major cities around the world on Friday, 26 October 2018. Climathon Brno is glad to join this year again in order to find the solutions to fight the climate problems in the beautiful city of Brno. The event will occur in Domeq. This year participants will be challenged with topics related to the problems and innovations in the city. Brno is preparing for its future right now and challenging its citizens to help to solve these problems. If you would like to participate (for free) you have to register via this website. One of the challenges is The Analysis of the Meteorological Station in Brno and Green Buildings and Community Space for Expats. The organizers are expecting other interesting challenges. 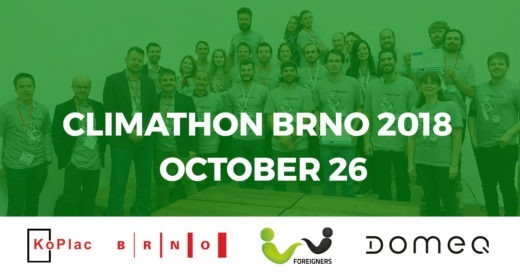 Climathon Brno will be held for the second time. Last year, there were 5 teams that come up with interesting ideas on how to fight climate changes in the city. The event was international with participants coming from all over Central Europe. If you want to know how Climathon Brno looks like check out the video from last year and follow the Facebook event. We are looking forward to meeting you in Domeq!